With around two breweries opening daily in America, a craft brewery relocation doesn’t usually constitute too big a deal for anyone other than its owners, employees, friends, family, regulars and civic leaders. But the Philadelphia region’s beer community has been talking about one upcoming expansion for years, and that’s partially because this particular company literally resuscitated Philly’s storied brewing industry when it opened in 1994. 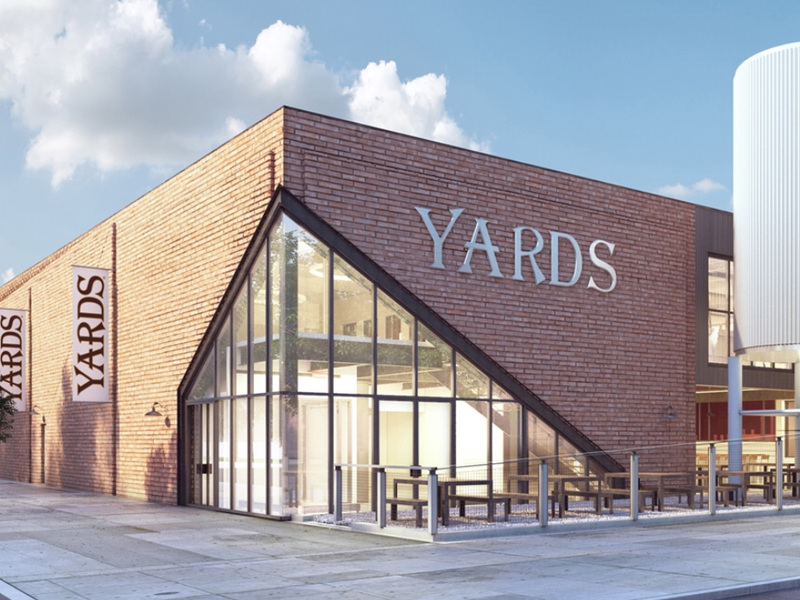 Having long ago made known the physical constraints of his current facility in the Northern Liberties neighborhood, Yards Brewing Co.’s highly visible, recognizable and beloved co-founder Tom Kehoe and his team will finally get to invite the public into a new 70,000 square-foot site somewhere around November 9. After a very public and drawn-out search for more space, Kehoe and his business partner, Trevor Prichett (not his original partner), decided to eschew lucrative offers from the suburbs in favor of staying close to their existing Center City location – something that most U.S. breweries can’t afford to do given high urban rents, limited space and zoning that often prohibits heavy industry. They are moving closer to the historic district, increasing the potential to entice hordes of tourists to walk the few blocks from the Liberty Bell and the National Constitution Center for a pint and a bite to eat in the taproom. But mainly, Kehoe and Prichett knew staying downtown was integral to Yards’ identity. “We’re always trying to tout the great brewing history of Philly,” begins Kehoe. “And it’s fabulously ironic that we’re going to have this brewery near where its rich culinary and brewing history and scene began and still thrives,” finishes Prichett. Their new block doesn’t resemble anything close to a destination yet, and that’s part of the point. Just as they settled in their corner of Northern Liberties when it still harbored neglected factories instead of the casino, live music venue, converted lofts and hip beer and cocktail bars that populate it now, they expect to similarly energize the fifth – successively bigger and better -- address their brewery has called home. Back when Yards moved into its third space, the abandoned Weisbrod and Hess brewery near the neighborhood known as Brewerytown, in 2002, it became the first to repopulate one of the 90 factories used to make Philadelphia beer in the 19th and early 20th centuries. And when Kehoe and his former partner turned their college homebrewing hobby into a commercial enterprise eight years before that, they ended Philadelphia’s first period without an operational brewery in more than 300 years, excluding Prohibition. “We’ve kept the same core values and they’re very Philadelphian: quality, humility and community,” Prichett adds. 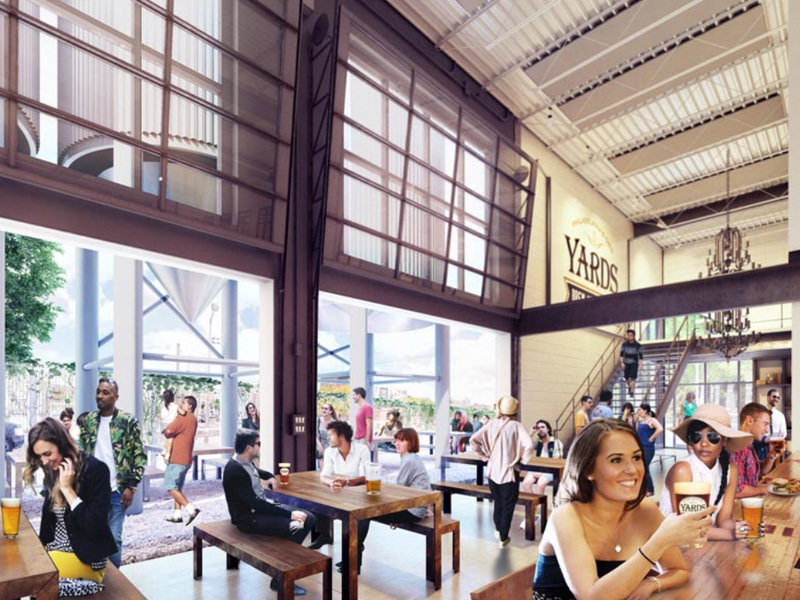 In keeping with its reputation, as described by Kehoe, as “the brewery that Philadelphia can’t live without,” Yards will use its 100 barrel brewhouse, first canning line and more than double its current capacity to focus first on filling the local market’s beer needs rather than immediately expanding distribution beyond its existing four-state footprint. But the brewers aren’t going to even test the new system until mid-December at the earliest. What Philadelphians and visitors will get to taste beginning opening day is the taproom, complete with 20 draught lines, scenic 360-degree views of the production and packaging floor, and food made by three-time James Beard semi-finalist Jim Burke, named to F&W’s “Best New Chefs in America” list in 2008. “One of our core values is quality and it was really important to us that the quality of the beer is complemented by the quality of the food,” says Prichett. Burke’s menu will not surprisingly center around beer, with dishes like pork belly kabob with Poor Richard’s Tavern Spruce Ale glaze and General Washington’s Tavern Porter and espresso chocolate mousse. Past visitors to Philly may recognize the tavern ales from City Tavern, the famed Colonial-style restaurant that hosted the Founding Fathers as they fiercely debated the Declaration of Independence and the Constitution late into the night. Centuries later City Tavern’s chef collaborated with Kehoe’s crew to research and improve upon recipes written by those same pioneering Philadelphians. The resulting beers have remained staples at the tavern, as they will be at Philadelphia’s biggest, newest and oldest continuously operating brewery establishment. Is Anheuser-Busch Done with Craft Brewery Buyouts?